Like this nice short gif. Any custom saved screens are unaffected. It won't delete or change anything. You will then see the list of preset screens loaded on the left menu. NOTE: If you edit any of the preset screens, it will not be overwritten as you have turned it into a custom screen. To restore it back to original, DELETE it, then click RESTORE SCREEN to load the original version of the custom screen. It's not identical to the Magic Formula. The idea is to find Magic Formula "like" stocks. This will search for stocks that are graded A for all categories in Q, V and G.
Not all A grade stocks are Trifecta's. NOTE: A Trifecta stock is NOT a recommendation to buy. A stock that scores highly in the Quality and Value score. Growth score is low. Stocks that have this character usually fly under the radar. Once fundamental and profitability growth kicks in, the market takes notice. A stock that scores highly in the Value and Growth score, but not Quality. For lack of a better name, this screen is named after Charlie Munger for his philosophy of paying a fair price for a great company with great future compounding potential. Single high grade stocks must be analyzed with more caution and financial analysis. Many of these can turn out to be traps. A Mom and Pop stock is considered high quality, but not cheap and without much profitable growth potential. Where value traps lurk and where most value investors tend to seek first. When you only focus on price, you can end up catching a falling knife. Proceed with caution. Companies with strong profitable growth and efficiency. This is NOT the typical earnings growth. It is related to profits and efficiency. However, these companies to fly high and must be analyzed with a holistic method. The broad idea behind this one is to find companies that are flush with cash and increasing cash profitability. Based off internal testing to see which of the 9 Piotroski factors outperform. You can read the original article from this link. 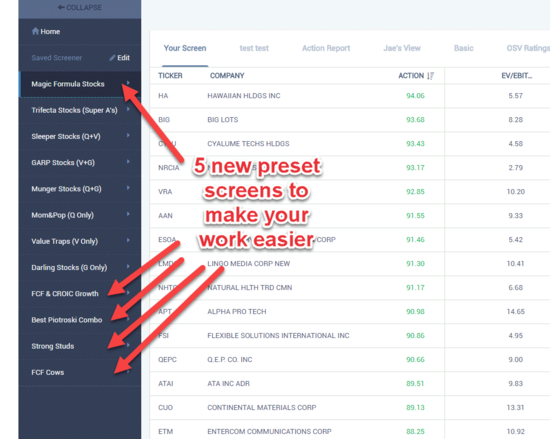 This is a quality based screener to eliminate stocks with red flag potentials. It's meant to be more of a preliminary filter. The good old method of looking for companies with low debt and increasing cash. Instead of looking for no debt companies, I created this to look for companies who have been paying down debt while increasing FCF.